← Is the state shrinking? Around the time of the budget, I heard quite a lot of talk about the economy returning to its pre-crisis level this year. 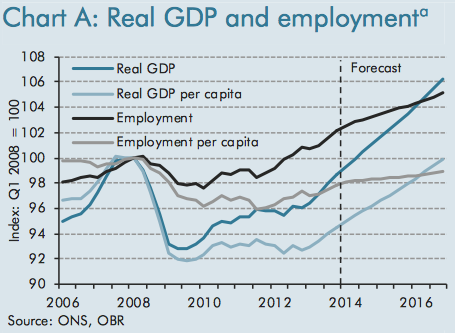 If the OBR’s forecasts are right, growth in 2014 should see the economy making up the GDP lost in 2008 and 2009. But that is about the only sense in which the economy could be said to be getting ‘back to normal’. The UK has more people now than it did in 2007 so, as the ONS reported yesterday, GDP might be getting close to where it was before the recession but per capita GDP still has a long way to go. Even this may be an unduly optimistic way of looking at things though. After previous recessions the economy has not only restored lost GDP. Eventually, it has returned GDP to the level it would have been at had growth stayed on trend. The UK economy has grown at an average of 2.6 percent since 1948. After each recession, a post-recession boom has compensated to the extent that the 2.6 growth trend has been restored. In other words, it takes the economy back to where it would have been had growth ticked along at 2.6 percent and the recession had never happened. It’s a bit like a train speeding to make up for lost time after a delay. This chart from the Resolution Foundation shows how long it has taken for the economy to make up for lost ground and return to trend growth after each recession. 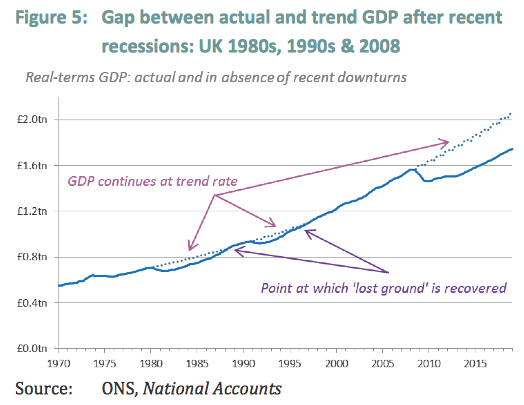 The damage from the 1980s recession was recovered within nine years, that of the 1990s downturn was recovered within six. 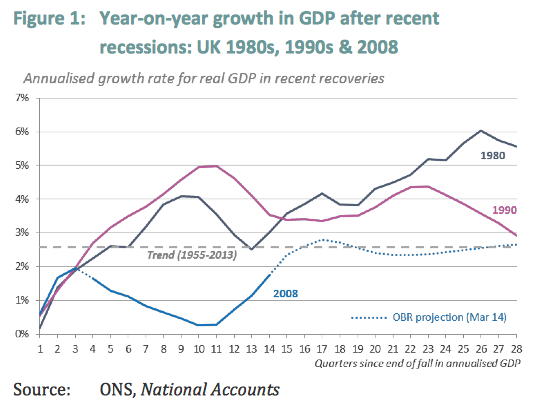 According to the OBR’s growth projections, though, the GDP drop from the 2008-09 recession was so severe and the subsequent recovery will be so weak, that the economy will not get back to trend growth. Or, to put it another way, trend growth is now well below 2.6 percent. The reason for this is that we haven’t had our usual post-recession boom. After previous recessions, growth has been well above the trend, sometimes up to 5 or 6 percent. This time, after an even deeper fall, growth is forecast to barely touch the trend. I have added the OBR forecasts to this ONS chart showing annual GDP growth rates. From these two charts, it’s easy to see what has happened. In the past, we have had small dips and then years of high growth. This time, we have had a huge crash followed by what looks like a very average recovery. 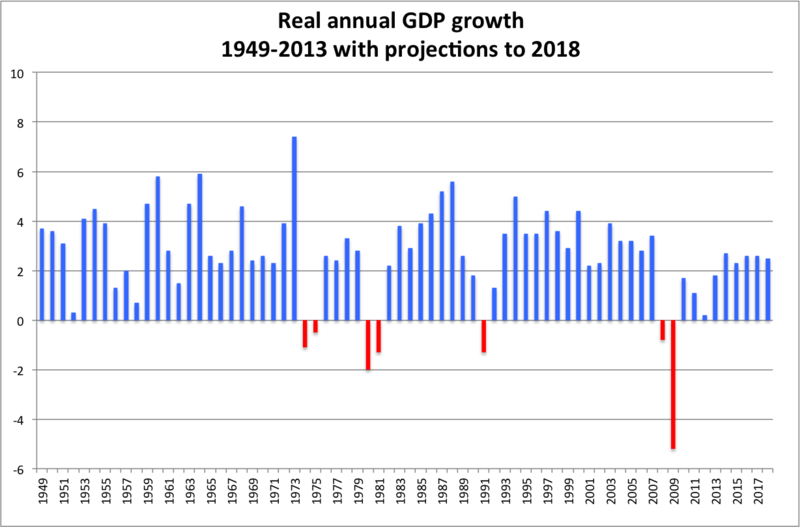 According to the OBR projections, we will go back to trend growth but without the boom years that usually come after a recession. The forecasts are being hailed as great news because the growth rates are so much better than anything we have seen in the past few years. Compared to those of previous decades, though, they are rubbish. In 2001-02, when the economy slowed down to a growth rate of 2.3 percent, there was an outbreak of pessimism. The same level of growth is a cause for celebration today. What we called a mini-recession in 2002 we are calling a recovery in 2014. According to the OBR, the spare capacity in the UK economy will have been taken up by 2018 and the growth rate will then return to its long-term average. We will have had our post-recession bounce; 2.7 percent is as good as it’s going to get. Of course, the OBR may be over-pessimistic this time, just as they have been over-optimistic in the past. Others think that the output gap is much higher and therefore the economy has more spare capacity for growth. However, even the most optimistic forecaster only gives us a couple of 3.3 percent growth years. That would be better than the OBR forecasts but still nowhere near what we have experienced after previous recessions. [T]he recovery remains muted relative to those experienced coming out the recessions of the 1980s and 1990s. Following past downturns, we have become accustomed to a period of catch-up growth, during which GDP has risen above its long-run trend, thereby closing the ‘lost ground’ created by the recession. This time round however, output remains some 15 per cent lower than we might have expected it to be had the financial crisis never hit. And projections from the OBR and that same panel of independent forecasters suggest that we might be waiting in vain for a rebound. With growth expected to rise more or less in line with trend for the next few years, the downturn might ultimately have created a permanent hit to UK output. 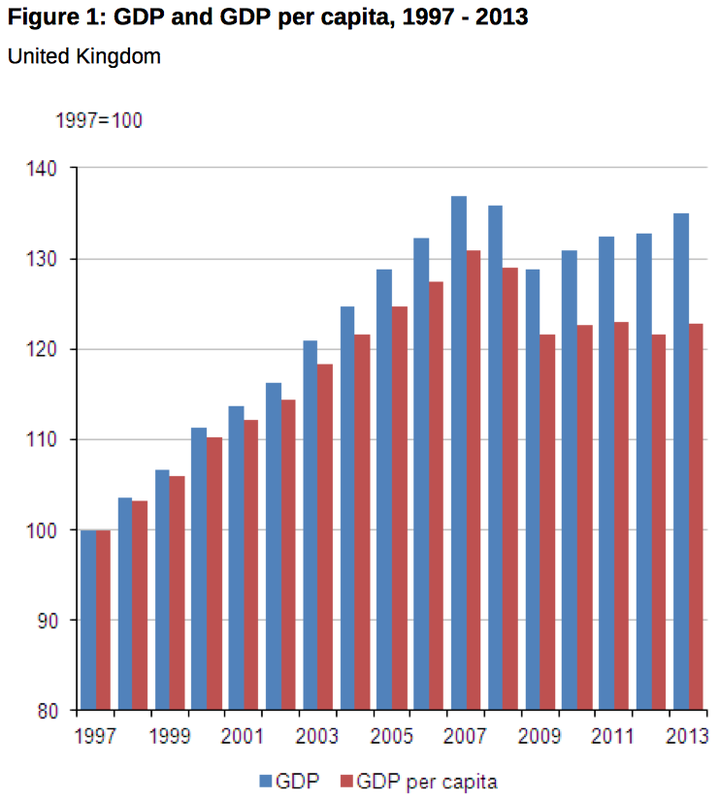 But, as they also point out, the problem of secular stagnation is not confined to the UK. It is a phenomena experienced not just in the UK, but across a number of developed economies. The lack of inflation associated with the credit boom of the pre-crisis decade in particular supports the argument that growth would have been lower in the absence of the surge in borrowing. It’s just possible therefore that the true trend rate of economic growth is lower than we think. In the absence of a resumption of accelerating credit growth, the reality of secular stagnation might become manifest. In that context, projections for growth of around 2.5 per cent over the forecast horizon might represent a bounce after all. Once the catch-up period fades, we might face still more sedate economic expansion. If true, policy makers face an unenviable dilemma. Re-stoke private debt and risk generating the same problems of instability encountered during the last boom, or wean the economy off its credit addiction but face permanently lower levels of real growth. That last paragraph reminds me of the wonderful Onion spoof where we search desperately for the next growth bubble. The forecasts, even the most optimistic ones, suggest that the growth rates of just below 3 percent may be as good as this recovery is going to get. Some economists reckon that high growth is over for western economies anyway but, even if the post-growth claims are over-stated, it looks as though GDP will rise at a much slower rate than it has for most of the postwar period. This is, effectively, a re-definition of what we mean by a recovery. Unlike the rebounds of the past, this time growth never gets back to the postwar trend. It means that we are now into an era where normal economic growth will be lower than most of us have been used to for all of our working lives. We have built our society on the assumption that the long-term 2.6 percent growth rate would carry on well into the future. It looks like we might have to re-think that one. You have previously posted on changes to workforce patterns and there has been some recent debates about the long-term unemployed. It would be interesting to try and forecast the impact of a future of chronically low growth will have on the workforce. Potentially the emergence of the ‘4G’ workforce (with extended retirement ages and lower pensions this may increase further) and the ‘trap’ of the long-term unemployed may work against each other. The post-recession boom may provide an opportunity for the short-term unemployed to move back into employment. I don’t know whether the data backs this up, but there may be evidence of a cyclical workforce who move in and out of work through changes in overall growth. If the return to grow is slower and less marked, those who bounce back into work may have less opportunity to find employment. Therefore, if unemployment over 6 months makes someone much less employable, and over 12 months almost unemployable, the lack of an aggressive recovery may result in a larger volume of the potential workforce being removed from the ‘viable’ workforce. 4G may worsen this, as the historic attrition rate of the elderly out of the viable workforce may lessen. Perhaps, not quite an alternative between a job (or jobs) for life (if you can get one) on the one hand and no prospect of a job in your life on the other. The skills shortage issue, if addressed may reduce the long-term unemployed ‘trap’. But maybe not if the ‘skilled’ workforce work to 75? I think this may need rewriting in September: http://www.ft.com/intl/cms/s/0/457b9332-be6c-11e3-b44a-00144feabdc0.html#axzz2yC2vYWQY Going to be interesting to see what the new data tell us. The ONS is changing how it measurers saving, R&D and military manufacturing amongst others. I think we’re going to see much of the GDP gap revised away. I see what you are saying but won’t the historical comparisons still hold? In other words, if we had measured GDP this way in the past, the recoveries would still have been stronger and taken less time than this one?